My last post was about the importance of looking in every direction (even up!) when out and about on a photo walk. You might of read that and thought “well that’s all very well and good Adam, but not everyone gets the chance to go outside all the time” which of course is very true. Many things can keep us in, babysitting, the weather, waiting in for a delivery, even just having a long day in the day job etc. So the image in this post has been bought to you, courtesy of my Mum’s house! I can’t remember what reason was keeping me in, but I found myself pottering around, looking at the parts of my childhood home that hadn’t changed in decades and also noting things that were new. It all comes down to seeing, to looking… There’s a whiff of Sherlock Holmes about it to be honest! No, you don’t have to infer that a pocket watch belonged to a man habitual in his excessive drinking habits, because of the fumbling marks left by an intoxicated use of the winding key! No, not at all, that’s the stuff of fiction. But you should learn to look at things as they truly are, try not to ‘skim read’ the visual input from your eyes, no matter how mudane or every day the things are that you’re looking at. 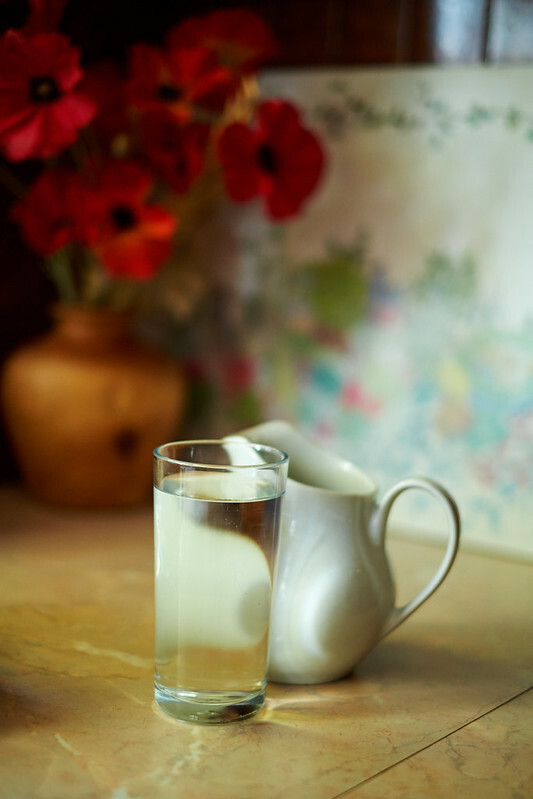 For as long as I can remember, my Mum takes a small jug of water and a glass up to bed each night, each morning it’s brought back down and left, ready to emptied and replenished in the evening. The jug is new, I don’t remember that one! The colourful chopping board I remember from being a kid. The flowers are new, I don’t recall seeing them before. So there we have a little scene, old item, old ways (with a new jug!) and new flowers. Just sitting there ready to be photographed. But that doesn’t mean you shouldn’t take the shot, in fact you might just find that a mosaic of imperceptably personal objects will speak to the viewer in quite a strong way. Even if they don’t know your Mum!